Despite longstanding lack of success in helping to broker a solution to the Israeli-Palestinian conflict, Secretary of State John Kerry has put the issue high on his agenda with several visits to the region seeking to revive peace talks. He may soon make his fifth trip to the region since taking office this year. Israelis and Palestinians differ widely when it comes to their views about the U.S. and the Obama administration. More than eight-in-ten (83%) Israelis have a favorable view of the U.S. compared to just 16% of Palestinians — a 67 percentage point difference. The divide is just as stark when both sides are asked for their perceptions of U.S. policies in the region. Just under half (47%) of Israelis regard them as fair and another 35% say those policies favor their country. In contrast, just 2% of Palestinians see U.S. policies as fair and 95% say they favor Israel. 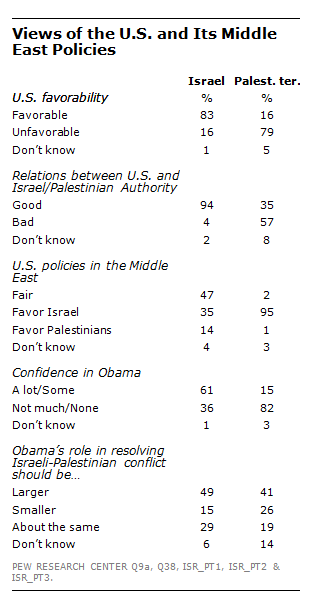 When it comes to President Obama, 61% of Israelis express confidence in him compared to only 15% of Palestinians.